While we were in Blairsville, we made a journey to the small town of Helen, GA. Helen is a decked out Alpine Village town about 30 minutes from BVille. We go every year and visit the Main Street shops. There are two shops that we absolutely love – Betty’s Country Store and Hansel & Gretel Candy Kitchen. I always purchase a variety of food items at each of these stores and have yet to be disappointed. Hansel & Gretel Candy Kitchen serves up a wide array of homemade chocolate and candy items. I always sample a few bites of fudge and then select some items from their huge displays. I found an item this year that I don’t remember seeing before – Chocolate Covered Ritz Bitz Crackers. Along with the rest of my order, I requested two of these suckers, and left with a baggie full of treats. I didn’t actually eat anything from Hansel & Gretel until we got back to Naples. And boy, was I in for a surprise. When it came time to try the Chocolate Covered Ritz, I was surprised by the size of the cracker. I guess I didn’t realize the actual size of it when I ordered and the sign simply said Chocolate Covered Ritz. 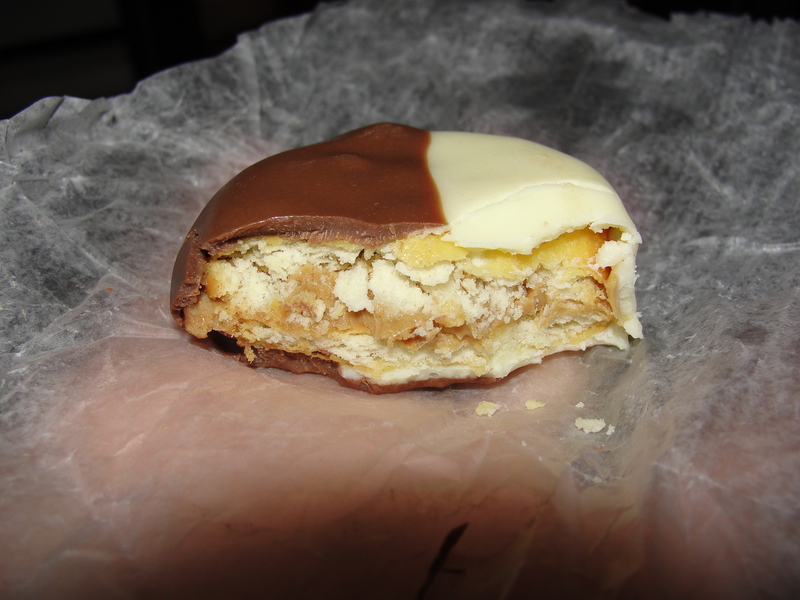 The Chocolate Covered Ritz was covered with milk chocolate and white chocolate and was quite large in height. My first thought was maybe this creation was multiple Chocolate Covered individual Ritz covered with a ‘coat’ covering of milk and white chocolate. I couldn’t wait any longer so I dug right in. What an amazing Surprise! Mmmm. Peanut Butter! Peanut Butter inside! Peanut Butter and Ritz Crackers and Chocolate all in one place! Mmmm. Ohh snap. When I bit into the Chocolate Covered Ritz, I bit through layers of chocolate, Ritz Crackers and a center of Peanut Butter. I was so excited at this fact. I took a few moments to let my mind catch up with my mouth and enjoy every single taste of the Chocolate Covered Ritz. The exterior of chocolate was very smooth yet rich in flavor. 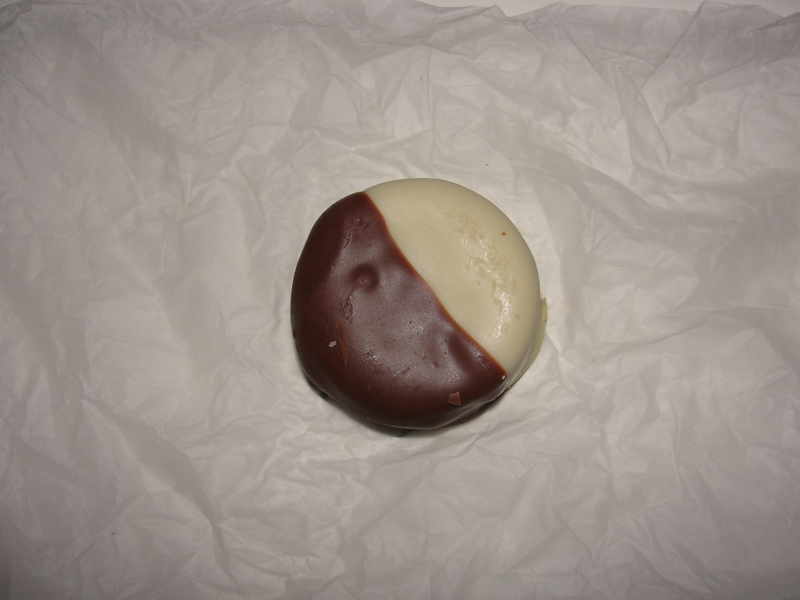 The white chocolate side had the perfect sweetness that I expect in white chocolate. 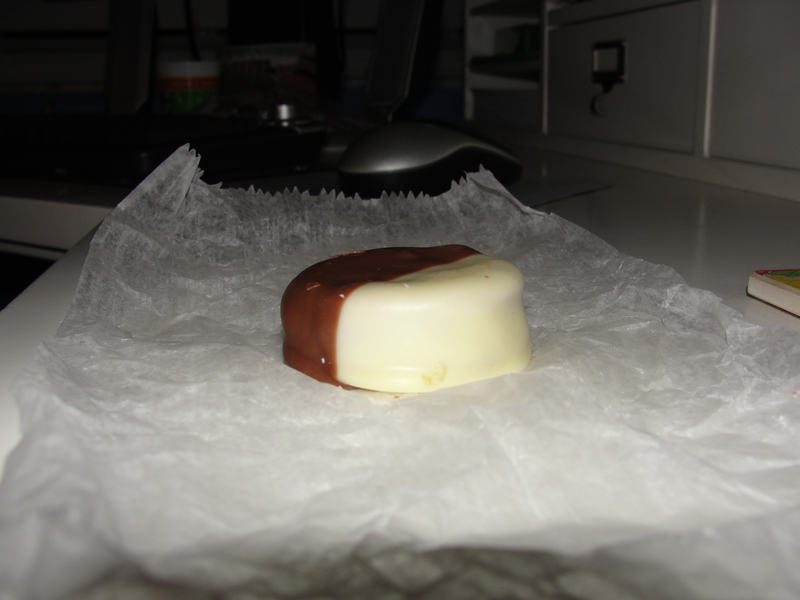 The milk chocolate had a very subtle flavor which blended nicely with the sweetness of the white chocolate. I was also able to get each bite to contain both white chocolate and milk chocolate which really increased the flavors I received. The chocolate was really only covering the Ritz and peanut butter and there was not an overabundance of it. This was really a good thing in my eyes. Far too often, chocolate covered items become chocolate drenched items and you lose the flavor of the item itself. Hansel & Gretel did a great job with this and did not let this happen. I am still so surprised and excited that I not only receive a Chocolate Covered Ritz but, a Chocolate Covered Ritz stuffed with Peanut Butter! Yay! This will most certainly be on my list of items to purchase again and I will be purchasing many of these. I would consider making these at home…I mean, really, they are quite simple. Hansel & Gretel does a great job of providing quality homemade chocolate to go along with Ritz and PB. Due to the crazy amount of peanut allergies, they may want to consider adding that tidbit to their signage. But, for me, this was a fantastic chocolate covered surprise.